This delicious white bean cashew dip has a healthy secret: fiber! So you can snack smart :) Thanks so much to Laura Theodore, amazing vegan chef and author of the vegan cookbook, Jazzy Vegetarian Classics. Chef’s Note: For a nut-free dip, replace the cashews with an additional can (15 ounces) of white beans. Start with 1 tablespoon water, (instead of 2) and add a bit more water, as needed to achieve the desired consistency. Creamy and low fat too! 1. Put the white beans, cashews, water, lemon juice, garlic, salt, and cayenne pepper in a high performance blending appliance and process until smooth and creamy. Do not over-process. 2. Transfer to a pretty bowl and fold in the diced pepper. Top with dill (if using). Serve with carrot sticks, celery sticks, pepper sticks or whole-grain crackers. 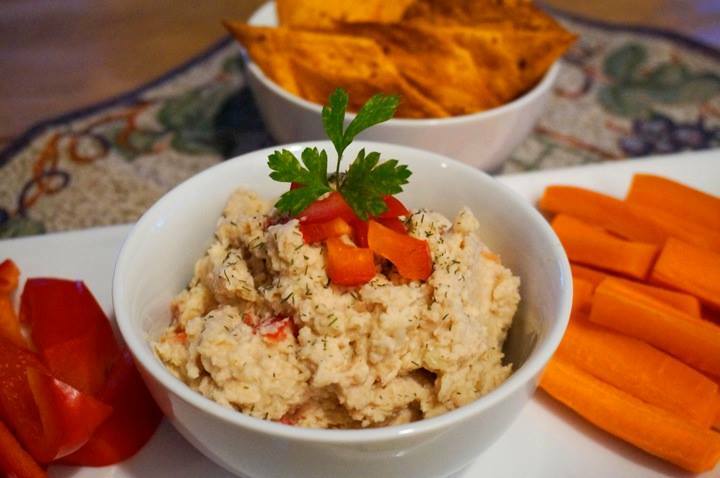 Let us know what you think of this easy vegan recipe: White Bean Cashew Dip!